Not much research had been done on rhinos before two veterinarians at the University of Pretoria, Gerhard Steenkamp and Johan Marais, started to treat animals that had survived poaching attacks. In 2012 they were called on to treat a rhino named Thandi whose horn had been hacked off by poachers at a private game reserve in the Eastern Cape. Thandi survived the attack and, two years later, she has recovered well and is pregnant. The two vets started a project called Saving the Survivors in response to the escalation of rhino poaching. In 2012 a total of 671 rhinos were poached in South Africa, and the annual tally has kept rising ever since. According to official figures released on July 31 2014, 618 rhinos had been poached since the beginning of the year, and in 2013 fatalities reached 1007. There are no statistics available on how many rhinos are injured in poaching incidents. Steenkamp specialises in maxillofacial surgery, useful for dealing with facial traumas as a result of horns being hacked off. Marais specialises in equine surgery, and says that out of all mammals the rhino and horse are probably the most similar. Once the team started working in the field, however, they soon realised how much more needed to be done in order to save the species. Because they work at the university’s veterinary faculty, they are able to do more research than veterinarians in private practice and are currently the only two vets in South Africa able to perform certain procedures on rhinos that have survived attacks and other injuries. Much of their research is guided by the questions that other veterinarians are asking them. Through the South African Veterinary Association, an annual rhino workshop is held with representatives from all the provinces of the country. This is an opportunity for vets working on rhinos to come together to share their experiences and expertise. “Our work is clinically driven. Everything we research is done so that we can apply it tomorrow in the field and so that other vets can benefit. We want to train others so there are more hands to treat this very big problem,” says Steenkamp. 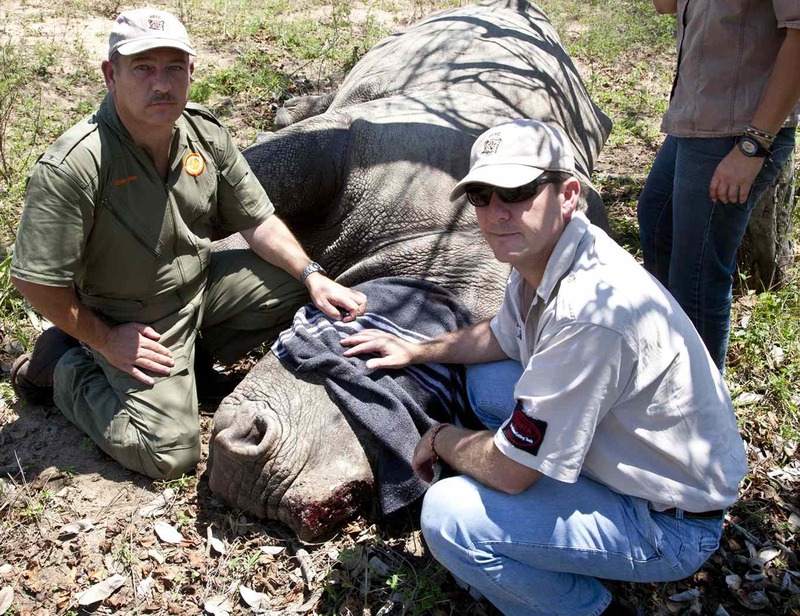 The two vets have treated about 60 rhinos since establishing Saving the Survivors. Most of their cases result from gunshot wounds, snare wounds and facial trauma. It is very important that these rhinos are treated as soon as possible after they are injured in order to prevent infection and other complications. Having successfully treated seven rhinos for facial trauma, they now have a protocol that works. The treatment for a typical face wound where the horn has been removed consists of cleaning the wound and applying wound material. A fibreglass-based dressing is then screwed into place over the wound so that the rhino is not able to remove the cover against the nearest tree. Because it is impossible to treat a wounded rhino daily, they had to find material that would only need to be changed every six weeks. While rhino tissue heals incredibly well, large gaping wounds do take a long time to heal. Sometimes the vets have to make the hard choice to euthanise a rhino that is suffering severely as a result of injuries they cannot treat. Reflecting on the ongoing poaching situation, Marais says one of the biggest challenges South Africa’s rhino face is lack of money and time to deal with the fall-out. “More money needs to be put into research, treatment methods and equipment to make treatment possible,” he says. Every cent donated to Saving the Survivors goes to the treatment of and care for rhinos left behind after brutal attacks. The university and veterinary association cover all administrative costs involved in the project.